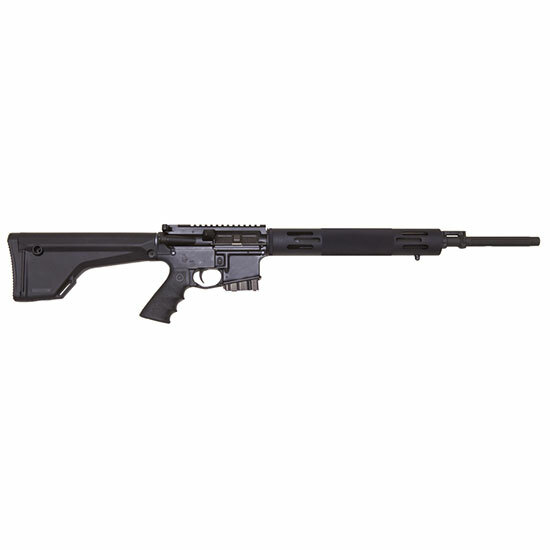 Bushmaster 90629 XM-15 AR-15 Predator State Compliant SA 223|5.56 20 5+1 Blk in. Built as a result of numerous requests by the hunters who wanted a slightly shorter barrel and lighter swing weight in a carry rifle for predator huntingcalling this 20inch barreled version of Varminter will deliver all the accuracy you have come to expect. The 20 barrel is fluted 4150 chromoly vanadium steel with sharp 18" twist rifling for heavier bullets typically used on bigger varmints and predators. Predator features include a hybrid SAAMI Spec. chamber two stage competition trigger 3.5lb. take up and 1 lb let off a vented aluminum freefloater forend with bipod stud B.M.A.S. 12" mini risers for optimum scope positioning and cheek weld Hogue ergonomic ambidextrous pistol grip and a 5round magazine legal for hunting in most states."